The Choral Music Experience library is a culturally diverse and distinctive repertoire appropriate for study and performance. Based on the concept of "education through artistry" the choral series is organized in levels of musical challenge spiraling upward in complexity from Beginning to Advanced. Review: "La Lluvia" is a folk melody from Ecuador traditionally played on the siku - the double row of panpipes that have been used in the high Andes for over a thousand years. Hot-blooded and haughty, a mixture of delight and disdain. The central paradox of performing "Las Amarillas" it that the rhythms must be very incisive and exact, yet the precision must be combined with the devil-may-care festive attitude that prevents the precision from sounding clinical. Mangulina is a dance derived from Zapateado Espanol (a Spanish heel-tapping dance). "Guayacanal," originally written in the 1950's by Dominican songwriters Luis Kalaff and Bienvenido Brens, embodies what is known as the Mangulina today, and is so famous that when asked, people often think it's a folk song. This piece is best accompanied with tamborra (a double-headed drum from the Dominican Republic) and guira (a metal scraper from the Dominican Republic, scraped with a metal fork.) These delightful miniatures are wonderful for concert, contest and small ensembles. Careful part-writing and attention to range make these a good choice for younger treble groups. Includes: "A la puerta del cielo (At the Gate of Heaven)," "El Senor nacio en Belen (The Lord Was Born in Bethlehem)," and "Gloria a Dios en las Alturas (Glory to God in the Highest.)" Roger Bergs : Cantad al Señor! This is one of the most popular love songs from the Dominican Republic. 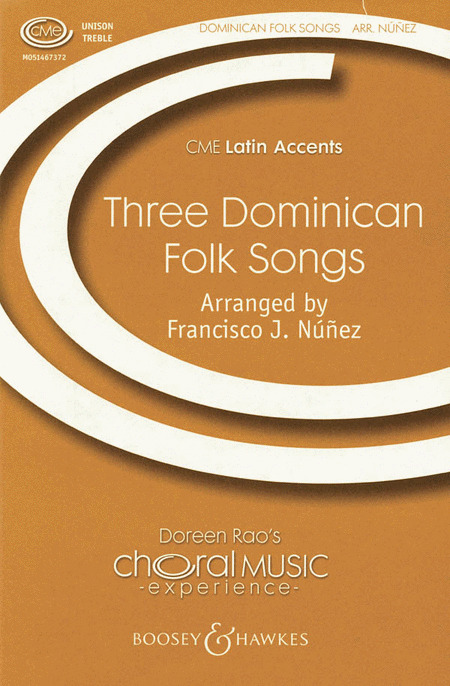 It describes a modest, and yet beautiful, little rural house in the Cibao region where the composer evokes the consummation of a passionate and virginal love. It is a "cancion-bolero," a typical Caribbean romantic song form in quadruple meter, slow-paced, which is also a centerpiece of serenades. Chanflin is a typical Dominican merengue in its melody and form. Chanflin is a young woman, very good looking. The merengue section refers to a "neighborhood gossip." The jaleo section refers to Chanflin dressing in a finicky manner. Here is a well-known song from Mexico. The piano part resembles the layers of the mariachi ensemble which uses violins, trumpets, bass and several types of guitars. This arrangement was commissioned for A Community that sings! to promote singing folk songs from around the world and by all levels of singers. This arrangement may be sung in unison, or with three equal treble or low voices. 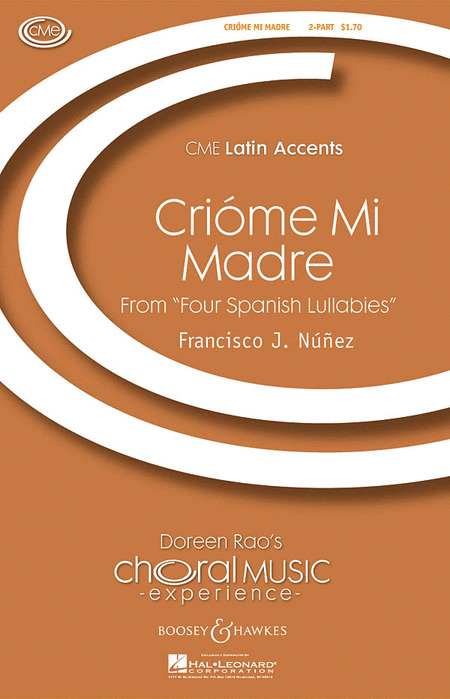 An original lullaby based on anonymous texts, Crióme Mi Madre tells a beautiful story in which the narrator remembers his mother singing to him and foretelling a wonderful future for him, one that did not necessarily come about. From Four Spanish Lullabies. This is a traditional Christmas lullaby from Mexico. This arrangement is created to be performed in either Spanish or in English or a combination of both. An optional guitar accompaniment for finger style playing may also be used for harp or piano. Roger Bergs : El Cielo Canta Alegria! This Argentinian worship song pulses with rhythmic energy! Perfect for either a first-time world music experience or a full-fledged Latin styled performance. With piano. Duration: ca. 1:30. This truly unique work was written to commemorate the 50th anniversary of the Puerto Rican Institute of Culture. Full of sonorities, rhythms, and melodies that capture the very essence of Puerto Rican culture, Estampas Criollas pulses with the beat of this tropical island. These original settings create the feeling of tenderness and sorrow so typical of the Spanish lullaby. A litling Brazilian style lullaby, a 3-part a cappella chorus, a flight of imagination for guitar solo and a comical nursery rhyme make up this compelling set. Mangulina is a dance derived from Zapateado Espanol (a Spanish heel-tapping dance). Guayacanal, originally written in the 1950's by Dominican songwriters Luis Kalaff and Bienvenido Brens, embodies what is known as the Mangulina today, and is so famous that when asked, people often think it's a folk song. This piece is best accompanied with tamborra (a double-headed drum from the Dominican Republic) and guira (a metal scraper from the Dominican Republic, scraped with a metal fork). This is a folk melody from Ecuador traditionally played on the siku - the double row of panpipes that have been used in the high Andes for over a thousand years. With percussion. Hot-blooded and haughty, a mixture of delight and disdain. The central paradox of performing this piece it that the rhythms must be very incisive and exact, yet the precision must be combined with the devil-may-care festive attitude that prevents the precision from sounding clinical. This is in the southern Mexican style of the Huapango. In this fast and fun music, with the flash of reds, yellows and greens and the flash in the rhythm, it's as if the entire landscape becomes the dancer's dress with a riot of color represented in the music. Commissioned by the Phoenix Boys Choir, this expressive setting offers a unique perspective on the favorite Mexican folksong. 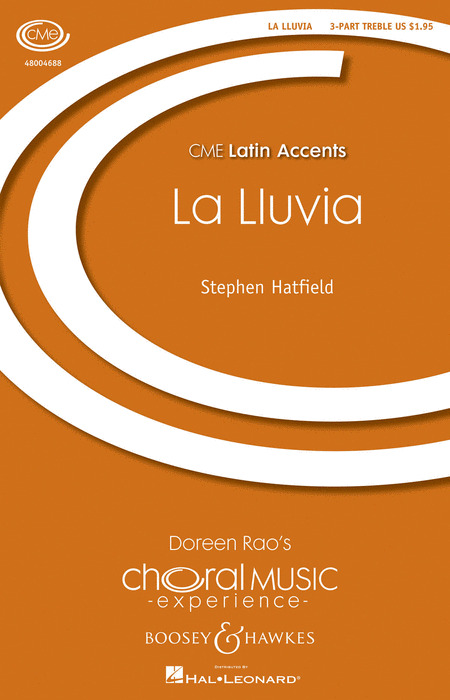 Written for 5-part treble voices and optional percussion, this latin thriller will challenge your group and delight your audiences. In this irresistible Brazilian song setting, vocal lines imitate percussion patterns to create a truly infectious groove. Newly arranged for SSATB chorus. With optional percussion. A traditional Andean folk song set for three-part treble choir, this setting employs the use of exciting percussion and authentic vocal effects. The slow, melodious theme of the introduction leads into an intensely driven middle section which will excite singers and mesmerize listeners. 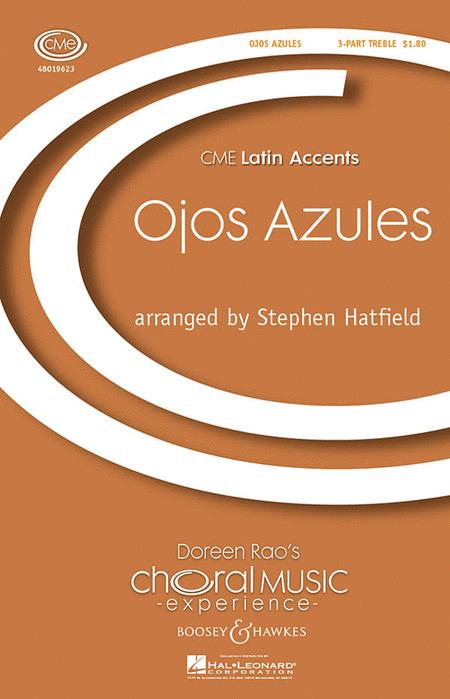 Combining the Andean folk song Ojos Azules with folk songs from Ecuador and Peru, this is the sort of music that Stephen Hatfield has excelled at for so long. Scored here for choir and percussion - small and large shaker, guiro and floor tom - it will be impossible for your singers to refrain from moving to the music and the audience from dancing in the aisles. This fun, fast-paced salsa was created as a fusion piece, mixing New York salsa with urban funk, and as described by the composers a hip Latino piece. The touching text is about the power of dreams, written using both English and Spanish. Duration: ca. 3:00. 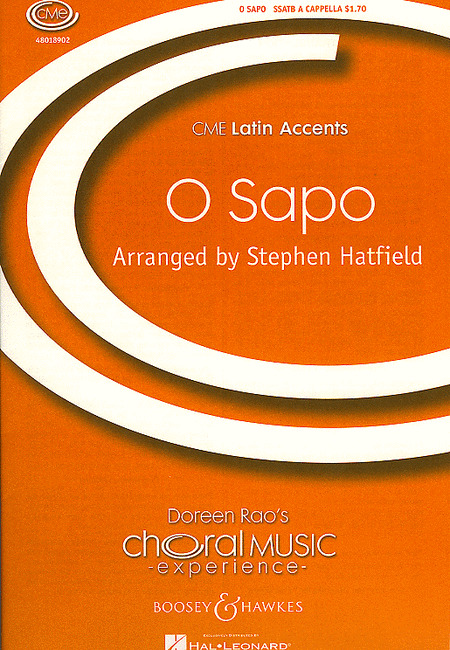 A Hatfield original, the text of this piece grew from email exchanges between the composer and the staff and students at the middle school who commissioned the work. The theme of the piece deals with testing what is true and how each person goes about that. With a great beat, Latin percussion, and optional string bass, this rhythmically-driven piece really cooks. Rhythmic and dance-like music captures the joyful text of Mexican poet Amando Nuervo. With piano. Son de Camaguey is a Cuban folk song from which the composer takes the refrain and then frames it with kaleidoscopic patters of ostinati inspired by the song, and by Afro-Cuban music in general. 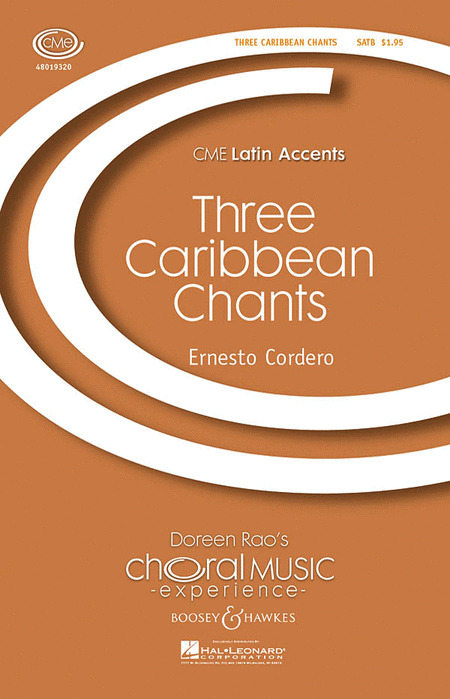 Acclaimed Puerto Rican composer Ernesto Cordero has infused his Puerto Rican and Afro-Hispanic style, ranging from upbeat to melancholic, into this delightful collection of Three Caribbean Chants. A children's game Brinca la Tablita (Jump the Blocks), a dreamy lullaby Duermete Mi Niño (Sleep My Baby) and the humorous Arroz con Leche (Rice Pudding) make up this charming set of traditional folk songs. Can be sung in Spanish or English (pronunciation guide included), these songs are perfect for young choirs or singing in the classroom. Infectious rhythms and playful melodies characterize this setting. These newly composed melodies and rhythms, while not distinctly Venezuelan, capture the vitality and charm of the region. Duration: ca. 3:00. Written with a contemporary Salsa feel and a text created from a collection of letters from the chorus of the Forest Ridge School of the Sacred Heart, this work expresses ideas about life in high school and the feeling of moving on. Scored for piano and optional guitar, cello, bass and percussion. Duration: ca. 3:30.